In 2016, I’ll be in Seattle, Philadelphia, Toronto, York, Maine, Ft. Lauderdale, and Boston. You can see my upcoming events on my schedule page here. Over the last few years I’ve posted the same message on my Facebook page to kick off the New Year. It’s a powerful resolution that can change your life and the whole darn world! This idea cuts right to the heart of everything I teach (and study myself). And this week, I plan to use this year-end down time to explore what it means to love myself more in 2016. What needs have to be met in order for me to become an upgraded version of myself? What story (or stories) do I need to stop telling myself? Who do I need to forgive once and for all? What do I need to release from my life in order to feel free? What behaviors or habits would I like to change? What behaviors or habits am I willing to accept and embrace? What new adventures do I want to experience? Where would I like to invest more of my time and energy? I’m also adding an interesting twist to this process of self-examination. I intend to ask Michael and a few close friends to tell me how they think I could love myself more. I imagine the people closest to me can see things I can’t and I look forward to hearing what they have to say. I invite you to join me in this inquiry process. 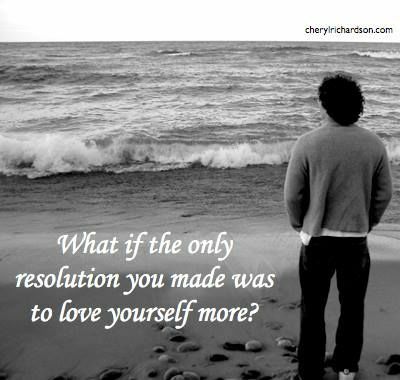 How will you love yourself more in 2016? Feel free to share your thoughts with me – I’d like to know. In the meantime, have a wonderful end to 2015! Here’s a beautiful holiday video from Enya. You can watch it here. Thanks, Jacalyn!